Seventeen Hawai‘i high school graduates are recipients of Chancellor’s Scholarships from the University of Hawai‘i at Hilo. The incoming freshman come from high schools located on Hawai‘i, Maui and O‘ahu. The prestigious award, estimated to be worth more than $22,000, is presented annually to outstanding graduates from Hawai‘i high schools. The University of Hawaiʻi Board of Regents approved at its May meeting a Doctor of Nursing Practice program at the University of Hawaiʻi at Hilo School of Nursing. The new program will begin August 2012 for post baccalaureate students and will be open to post masters-level students in 2013. 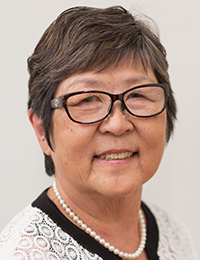 “The UH Hilo School of Nursing is responding to the concerns of our community and has worked diligently to improve community access to quality healthcare in Hawaiʻi,” noted Katharyn Daub, director of the school of nursing. The Doctor of Nursing Practice is a doctoral degree for nurses at the highest level of nursing practice. 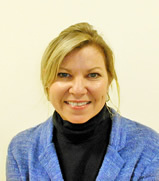 The American Association of Colleges of Nursing has proposed that the DNP degree be the level of entry for all advanced practice nurses by 2015. 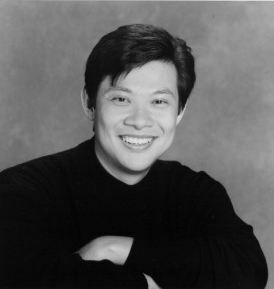 Keiki Kawai‘ae‘a received the 2011 Koichi and Taniyo Taniguchi Award for Excellence in Innovation. 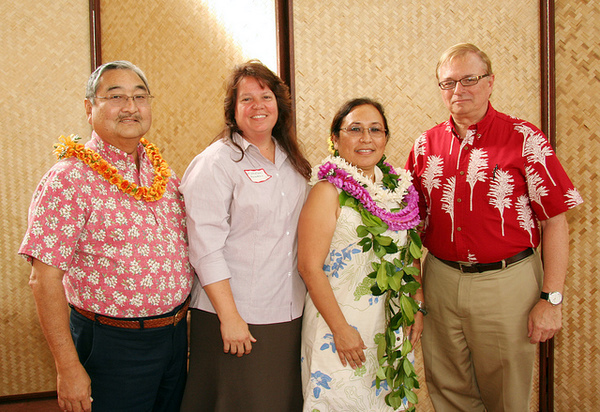 (l-r) Barry Taniguchi, nominator Alohalani Housman, honoree Keiki Kawai‘ae‘a, and UH Hilo Chancellor Don Straney. Aloha and Welcome to the UH Hilo Awards and Recognition Ceremony. As we gather to recognize our honorees, I’d like to take this opportunity to recognize and say “thank you” to all of you. It has been almost a year since I first arrived at UH Hilo, and it’s been an extraordinary learning experience. I’ve found a good deal to admire about our faculty and staff and our entire university community. Your dedication contributes greatly to our success and it’s been an absolute pleasure working with you to move UH Hilo forward. Today, we’ll recognize our recent retirees, our faculty and staff years of service, and we’ll also announce the winners of this year’s UH Hilo Awards. Before we start with our ceremonies, I’d like to briefly update you on a few things. The strategic planning process is drawing to a close, and we currently have a draft plan that is widely supported on campus. I’d like to thank everyone for your participation. By the end of spring semester we should be distributing the working draft. Next year, we’ll be using it to adjust the course of our university through implementation. Planning is underway for a very exciting new development: the launch of an ambitious new scholarship program at UH Hilo one year from now. Details are still being worked out, so I am not at liberty to reveal the donors. Funding 4-year scholarships for ten entering students beginning with the 2012-13 academic year. Scholarships are reserved Big Island high school graduates who have limited financial resources and are first in their families to attend college. Ten scholars will start UH Hilo in 2012, with ten more added each year until program reaches 40 participants annually. Just as exciting, each cohort of students will receive specialized support services and the opportunity to participate in four summers of uniquely designed programming here on the Big Island and elsewhere. Our own faculty and staff will be involved in the delivery of these programs and services. As you know, the current fiscal situation in the state presents a challenge to implementing the changes the campus would like to see. The budget challenge is statewide: state government needs to make up a $1.3 billion shortfall in the next biennium. UH Hilo has already taken a 24.5% reduction in general funds over the last three years. Last week we learned how we fared in the legislature for CIP. We got 50% funding for student housing ($16 million) and permission to get the other 50% from revenue bonds. The legislature is also giving us $4 million towards the renovations and addition to Hale Kanilehua to accommodate living/learning centers. Please join us for the all-campus meeting on the budget set for Thurs., May 5 at 11:30am in Wentworth 1. 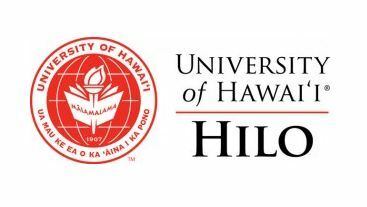 We’re confident UH Hilo will exceed this year’s graduation targets set for us by the UH System. 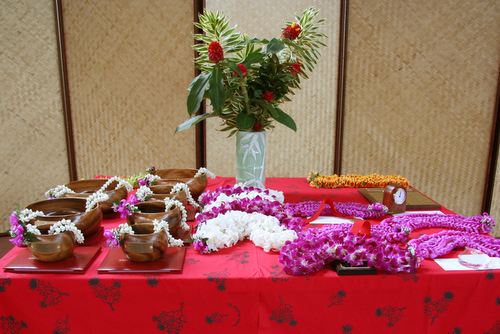 Display table of koa bowls and lei given to honorees at UH Hilo’s 2011 Awards and Recognition Celebration held May 3 at the Campus Center Plaza. Dr. Hank C.K. Wuh, a Honolulu entrepreneur and leader in Hawaiʻi’s biotechnology field, will deliver the keynote address. Entrepreneur Hank C.K. 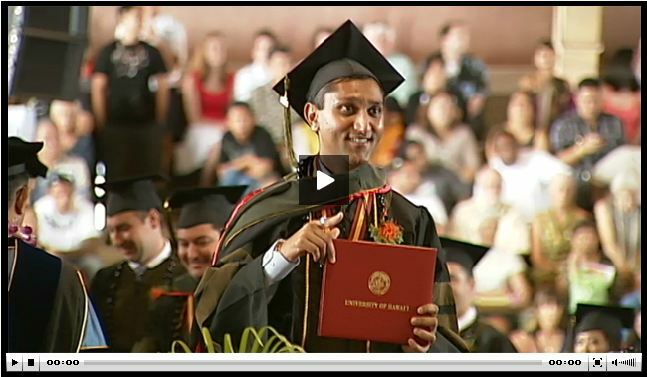 Wuh, MD, will keynote UH Hilo's spring commencement. The University of Hawai‘i at Hilo College of Pharmacy will award its first doctor of pharmacy degrees at spring commencement on Saturday. Dean John Pezzuto describes the class of 2011 as “dynamic and self-driven pioneers.” He said their graduation will clearly be marked as one of the most joyous days in the institution’s history. The 84 pharmacy students are among 607 candidates for various degrees and/or certificates, which also include the colleges of Arts and Sciences (402), Agriculture, Forestry and Natural Resource Management (27), Business and Economics (47), and Ka Haka ʻUla O Keʻelikōlani College of Hawaiian Language (23). Twenty-four others are candidates for various post-graduate honors. Dr. Hank C.K. Wuh, a Honolulu entrepreneur and leader in Hawaiʻi’s biotechnology field, delivers the keynote address. An orthopedic surgeon and inventor, Wuh has led the development of over 20 biomedical and consumer healthcare products from concept to global commercialization. Valerie Dionne, who receives bachelor of arts degrees in political science and administration of justice, serves as student speaker. A native of Arkansas, she has maintained a 3.91 GPA since leaving her job at the Hawaiʻi Government Employees Association to enroll at UH Hilo in 2008. A member of the National Political Science Honor Society Pi Sigma Alpha, Dionne was named the UH Hilo Chapter’s Most Outstanding Student for the 2010-2011 school year. She has made the College of Arts and Sciences Dean’s List each semester and is the recipient of numerous scholarships. She is active in campus and community activities and will attend the William S. Richardson School of Law at UH Mānoa in fall 2011. Commencement, to be held this Saturday, May 14, at Edith Kanaka‘ole Stadium, begins at 9:00 a.m.